Why Do I Get Hip Pain In Bed / When Lying On My Side? 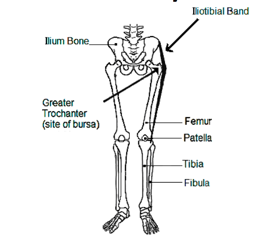 The Iliotibial band or ITB is a length of gristle-like tissue that runs a course as shown in the diagram below. It is comprised almost exclusively or reticular fibres which make it very tough and unable to be stretched. As you can see in the picture, the band changes direction around a notch of bone that is located where the buttock develops a ‘dimple’ when you clench the gluteal (buttock) muscles. Hip pain usually occurs at that point and can be located by pressing the area. This is important because, if you can touch the painful spot, be reassured that it is not hip joint pain. Your hip joint is too far inside you to be touched, indeed when you need a hip replacement, the pin occurs in the groin fold, about half way between the inside and outside edges of the thigh. You can see the location of the ball and socket joint on the diagram . Pain can also occur in the strip of hard tissue that you can feel running down the outside of your thigh or where the band starts or finishes as shown. This problem is also frequently misdiagnosed as sciatica or described as ‘referred pain’. Sciatica is in the rear of the buttock / thigh and will send pain throughout the area that the nerve supplies – the back of the buttock, back of the thigh, outside portion of the shin area and into the little toe. ITB pain is in the side of the thigh – it is not referred from the back. Pain will occur while walking (especially on slippery surfaces like smooth shoes on polished shopping centre floors), while lying on the affected side in bed and often while lying on the other side if the painful leg is allowed to flop forward and touch its knee to the bed. You may have learned you can sleep best with a pillow between your knees.